Rachel Godsil’s teaching and research interests include civil rights, constitutional law, property, land use, environmental justice, and education. She is a co-founder and director of research for the Perception Institute, a national consortium of social scientists, law professors, and advocates focusing on the role of the mind sciences in law, policy, and institutional practices. She collaborates with social scientists on empirical research to identify the efficacy of interventions to address implicit bias and racial anxiety. She regularly provides trainings and lectures to a wide range of private and public institutions seeking to address the role of bias and anxiety associated with race, ethnicity, religion, and gender and provided trainings on implicit bias to state judges across the country on behalf of the National Association of State Judges. Godsil is a lead author of the report: “The Science of Equality Volume 1: Addressing Implicit Bias, Racial Anxiety, and Stereotype Threat in Education and Healthcare” (2014) and A Tale of Two Neighborhoods: Implicit Bias in Environmental Decision-Making, in Implicit Racial Bias in the Law (Cambridge University Press 2011). Professor Godsil also co-authored amicus briefs on behalf of empirical social psychologists in Fisher v. Texas and the National Parent Teacher Association in the Parents Involved in Community Schools v. Seattle School District litigation at the Supreme Court. She is the co-editor of Awakening From the Dream: Civil Rights Under Siege and the New Struggle for Equal Justice (Carolina Academic Press, 2005). 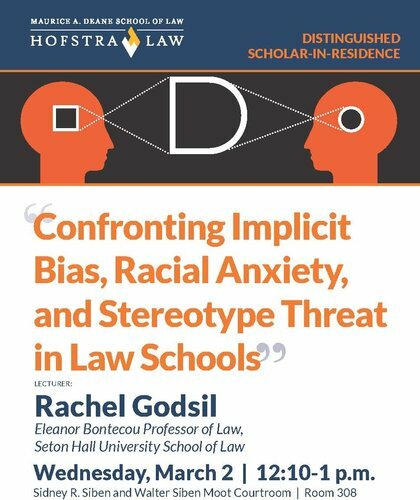 Godsil, Rachel, "Confronting Implicit Bias, Racial Anxiety, and Stereotype Threat in Law Schools" (2016). Distinguished Scholar-In-Residence Lectures. 1.